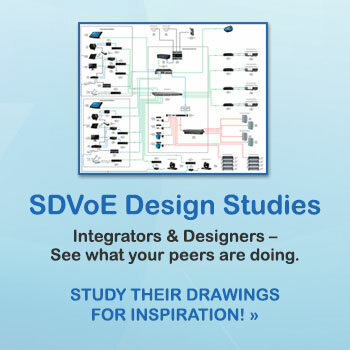 The SDVoE Design Partner Program is open to leaders in the field of AV over IP and experts in the design and architecture of SDVoE systems. The goal of the program is to establish recognized consultants and designers who can provide guidance to integrators, installers and end users in leveraging the SDVoE standard for high performance AV network deployments in education, healthcare, enterprise, entertainment, hospitality, retail, houses of worship, government, military, industry and security. This program is the next step in ensuring integrators and end users can take full advantage of the flexibility and scalability of Ethernet to deliver 4K video without compromise – and for the first time, to deliver AV and data on a converged infrastructure. Working with registered SDVoE design partners gives you the confidence to take advantage of all that SDVoE technology and AV over IP have to offer over traditional approaches such as AV matrix switching. SDVoE Design Partner Certification: What’s in it for Me? Complete the five training modules and the subsequent assessment with a score of at least 17/20. You will have the opportunity to list your name, title, company and contact information on the SDVoE website. We will maintain a public list of certified SDVoE Design Partners, but you will control what information we display.